Sowan beach is located in the Bogorejo village, Bancar Sub-District, Tuban. It precisely located in the border between Central Java and East Java, on the edge of the northern coast line. Sowan beach is the beach which is managed by Perhutani Tuban area, the atmosphere is very cool and shady though it located on the coast. 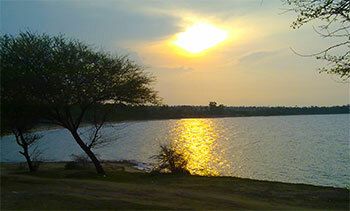 Sowan beach is lies in the green of the trees that managed by Perhutani, with an area of 32 acres. On the beach there are coral wall that juts into the sea and white sand. The visitors who come can enjoy the cool beach while fishing or enjoy seafood at food stalls around the beach. There are some diverse flora that can be found around this beach, like: Mahogany (Swietenia macrophylla), Teak (Tectona grandis), Akacia (Acacia sieberiana), Klampis (Acacia arabica), sugar apple (Annona squamosa), Mango (Mangifera indica), Guava (Syzygium sp.) etc. While the fauna around this beach are, Birds turtledove (Gopelia striata), Bird finches (Pycnonotus aurigaster), Starlings (Leucopsar Rothschildi), Sparrows (Passer Montanus), quail (Coturnix Coturnix), White Cacatua (Cacatua galerita), Bird trucukan (Pycnonotus goiavier), Weasel (Paradoxurus hermaphrodillus), pangolin (Manis javanica), Lizard (Varanus indicus).